In August 2016, doctors gave 33-year-old Nicole Gularte three to four weeks to live. She had relapsed with acute lymphoblastic leukemia (ALL) seven times over the last decade. ALL is a type of fast-moving blood cancer that causes the bone marrow to produce too many immature white blood cells, which can spread the disease to other parts of the body. If left untreated, ALL is deadly. Nicole had exhausted all her treatment options – except one. Her last hope was an experimental treatment known as CAR T-cell therapy. In cell therapy, immune cells (T-cells) are extracted from the patient and sent to a manufacturing facility where they are carefully reengineered and reprogrammed to identify and destroy cancer cells. The reprogrammed T-cells are then sent back to the patient’s treatment location, where they are injected back into the patient’s bloodstream to find the disease and remove it from the body. Nicole completed her CAR T-cell treatment on October 4, 2016. Five days later, she was declared cancer-free. Typically, fewer than 10% of patients with relapsed and refractory ALL, like Nicole, survive five years. Although Nicole’s story may not be typical for every patient, the first-in-class cell therapy showed an 83% overall remission rate in the ALL patient population who had limited treatment options and historically poor outcomes. Every day, medical researchers are making thrilling discoveries that could take the industry closer to making personalized medicines a reality for more patients like Nicole. But it is a complex process that involves more than manufacturing a pill. Each new cell therapy research discovery is only the beginning – then comes a complex, challenging and costly manufacturing process to make the therapies. Researchers and clinicians are grappling with the transition of how to deliver the lifesaving treatment to more patients globally – it’s about translating processes from smaller labs intended for clinical trials, to facilities optimized for industrial-scale manufacturing – a process that could reshape the future of medicine. “It can be a bit daunting for some researchers to shift from research into the clinical side. They soon realize that the appropriate steps required to comply with FDA regulations and guidelines are very time-consuming. The equipment, training, clean rooms and validation processes required to manufacture clinically meaningful doses may be new to them in some instances,” says Helen Huls, who worked in medical research labs, including CAR-T cell therapy labs, for nearly two decades and now advises as a consultant in the industry. Now a new cell therapy manufacturing platform could solve this challenge and potentially put personalized medicine within reach for millions of patients. The Enterprise Solutions for cell therapy is a scalable, start-to-finish cell therapy manufacturing platform from GE Healthcare that includes FlexFactory™, KUBio™ and Fast Trak™ integrated services – all designed specifically for the cell therapy market. FlexFactory is a cGMP-compliant manufacturing platform comprised of technologies that can be installed into new or existing facilities. KUBio is an entire prefabricated modular facility built from scratch, where the FlexFactory biomanufacturing process line is installed – the heart of a KUBio. Fast Trak includes process development services, helping simplify, integrate and automate the manufacturing workflow. Additionally, training courses provide a mix of classroom and laboratory instruction on cell therapy processes and cell manufacturing under GMP procedures. Cellular Biomedicine Group Inc. (CBMG), a leading clinical-stage biopharmaceutical firm engaged in the development of immunotherapies for cancer, has announced its plan to configure part of its facility in Shanghai with GE Healthcare’s FlexFactory platform, which will be designed to speed up manufacturing timelines for its cell therapy clinical trials and commercial launch. From start to finish, the process of getting a lab ready for optimized industrial-scale manufacturing would typically take a cell therapy manufacturer over 18 months to complete. FlexFactory can reduce this time by up to 50 percent, getting a company ready to manufacture at scale nine months faster, ultimately accelerating time to market and enabling clinicians to deliver therapies to patients sooner. CBMG will become the first company to install GE’s FlexFactory for cell therapy, and anticipates that the FlexFactory will be operational in the CBMG-GE Joint Laboratory of Cell Therapy by the end of 2018. GE Healthcare will also provide Xiangxue Pharmaceutical Co., Ltd. (XPH) with a FlexFactory™ to help scale up, digitize and accelerate manufacturing processes for their cell therapy clinical trials and future commercialization. This project marks the first-ever application of FlexFactory for cell immunotherapy drugs based on high-affinity and high-specificity T cell receptors (TCR). XPH aims to deliver a breakthrough for cancer treatment with a new-generation TCR T-cell therapy, and they have become one of the industry-leading companies to roll out related research for this application. GE Healthcare will also provide XPH with training services, process development, flexible cell processing equipment and digital connectivity solutions. The FlexFactory platform is expected to be operational in March 2019. Developing robust manufacturing processes is key, and that starts with a thorough process development program. Through collaboration with the Centre for Commercialization of Regenerative Medicine (CCRM), a leader in developing and commercializing regenerative medicine technologies and cell and gene therapies, GE Healthcare now offers Fast Trak process development services. The combined GE and CCRM team is comprised of 35 scientists and engineers with expertise in advanced therapeutic cell technologies, helping bridge the gap between research protocols and industrial manufacturing. Huls says this Enterprise Solutions offering has significant potential for the cell therapy labs at the front lines of medical breakthroughs. Although this offering is new to cell therapy companies, it’s not new to GE Healthcare Life Sciences. GE has offered similar services and processes for the bioprocess industry, including FlexFactory, KUBio and Fast Trak services. Daria Donati is the director of business development and innovation for the Bioprocess Enterprise Solutions team of GE Healthcare Life Sciences, which helped develop FlexFactory, KUBio, and Fast Trak training and other services to support the production of biologics. Her team has implemented multiple KUBio and FlexFactory solutions around the world, including China, Russia, Turkey and Brazil; expertise she used to help the cell therapy team translate and adapt these offerings for the cell therapy market. This new cell therapy end-to-end workflow solution allows labs to scale up production in different locations globally, something Donati saw in the bioprocess industry and dubbed the “copy and paste” effect in terms of the ability to replicate labs in different regions of the world. “The competition is high, so there’s a need to manufacture faster at high quality standards. So a company can buy its first FlexFactory and then they copy and paste essentially the same platform on the other side of the world,” Donati says. Ryan Gallagher, Business Development Leader for Cell Therapy Enterprise Solutions at GE Healthcare Life Sciences, says there are two main distinctions for the cell therapy market. The first is the need for tracking and traceability, and the second is the focus on training. “The traceability of the cell sample itself, even through the manufacturing room, is critical. Any deviation in the process would cause that therapy to not make it to the end,” Gallagher says. Eaker then explained how staff training is the second key distinction, which spurred the cell therapy team to leverage the Fast Trak training program offered in the bioprocess market. Gallagher also indicates that digital analytics is a focus for labs and manufacturers, who want to integrate different sources of information about the product and the patient. With analytics, they can make meaningful business decisions to change or improve the manufacturing process. In turn, this could help reduce errors and increase consistency, efficacy and safety for patients. Research within cell therapy often focuses on autologous T-cell therapies, where a patient’s cells are removed, genetically altered and cultured to strengthen their specificity to a disease, then injected into the same patient’s body to fight the disease. While this is exciting progress in cancer and immunotherapy, it’s also risky because of the manufacturing process complexities. 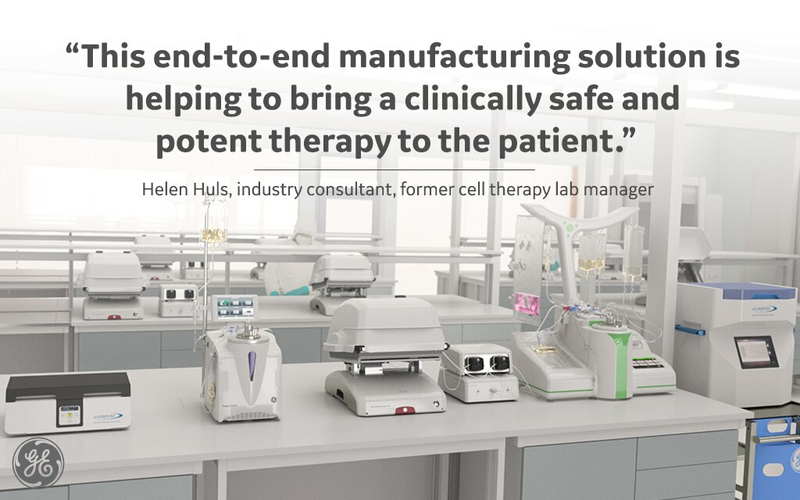 This cell therapy end-to-end solution helps address risk by providing manufacturing capabilities and services that help labs produce consistent, high-quality medicines. Researchers hope to continue bridging the gap between today’s diseases and tomorrow’s treatments. 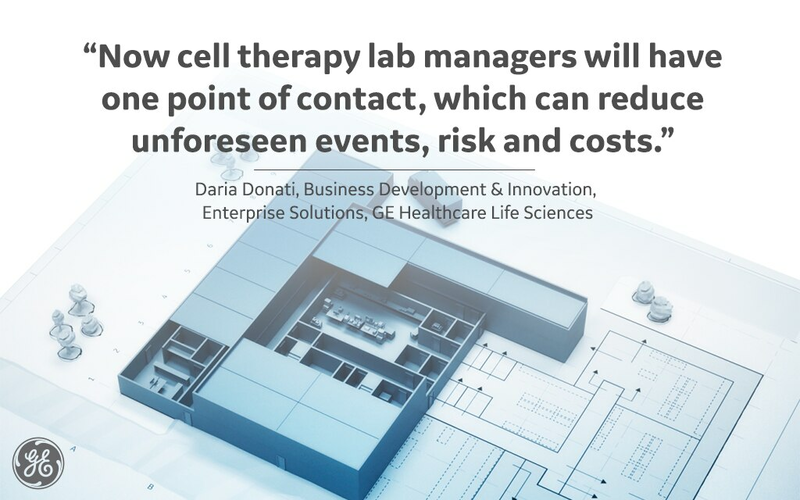 Get in touch with GE Healthcare on the new cell therapy manufacturing platform.